I love sweet potatoes and love trying out new things with them. I also love colour and especially on these dark Winter days. Colourful food is one of the easiest ways to know that you are packing your plate with natural vitamins and minerals. My bean salad is definitely colourful and especially when topped on baked sweet potatoes. This recipe is a great lunchbox filler too. Make the bean salad the night before and store in a container. Simply cook a raw sweet potato in your canteen microwave on high for 5 minutes and lunch is served. Add a green salad or some grilled chicken to really make a meal of this recipe or add some cheddar cheese on top, cook under the grill until melted and golden. Serves 4 as a side, 2 as a main. Preheat and oven to 200°C/180°C fan/400°F. 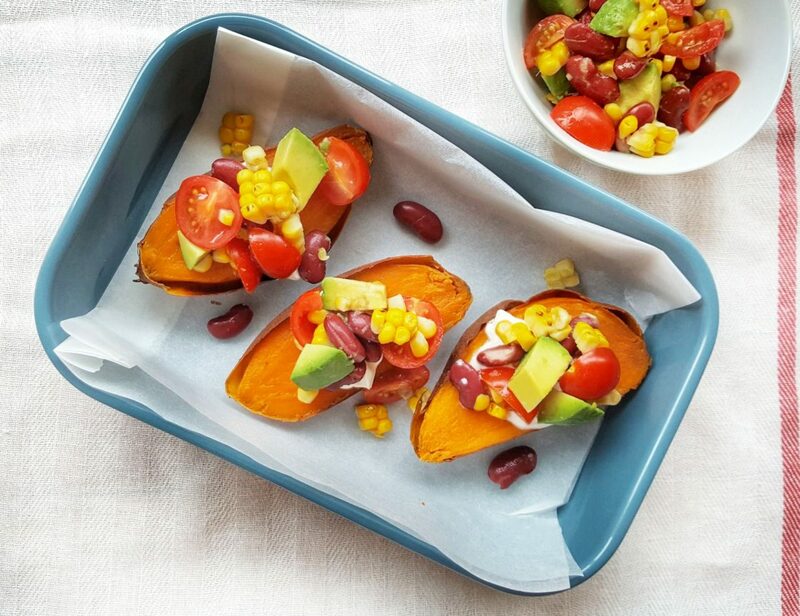 Place the sweet potatoes on a baking tray and place in the preheated oven. Bake for 20-25 minutes until soft through. You can also cook whole in the microwave on the highest setting for 5 minutes or until soft through. For the bean salad: Mix all the vegetables together in a bowl, stir through the lime juice and coriander until well combined. To serve: Spread 1 tsp of crème fraiche over the flesh side of each sweet potato, spoon over the vegetables and enjoy. Thank you!! Hope you enjoy the recipe, the bean salad is great on it’s own too.